In the nineteenth century the Yarnton turnpike gate was attached to the cottage to the south of the Turnpike pub at Yarnton (formerly known as the Grapes). This turnpike stop was then known as Peyman’s Gate, after George Peyman, who is listed in Gardner’s 1852 directory as the victualler at the Grapes. The Turnpike pub is Grade II listed, and dates from the seventeenth century (with eighteenth-century and later alterations. 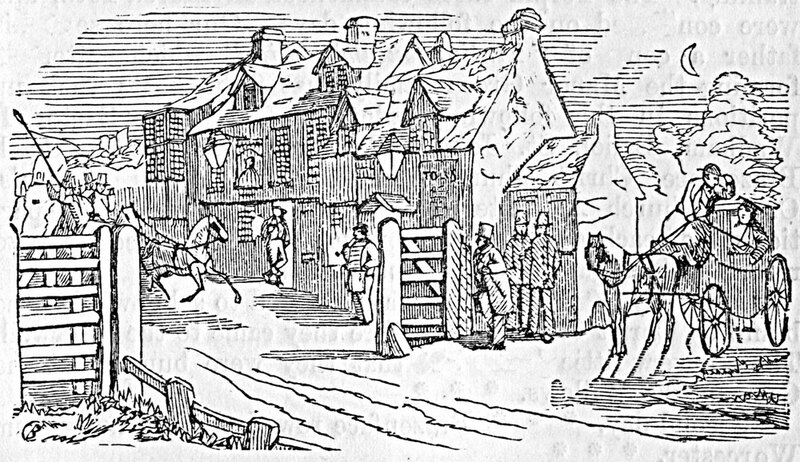 The above drawing of the Grapes with the turnpike gate is taken from Cuthbert Bede, The Further Adventures of Mr Verdant Green (Part II, Chapter X), published in 1854. In this picture the University Proctor in a top hat, with and his two “bulldogs” wearing bowlers, can be seen standing behind the gate waiting for the hapless Mr Verdant Green in the Oxford-bound “non-descript vehicle of the ‘pre-adamite buggy’ species” that he and his three companions had borrowed from The Bear (presumably the one at Woodstock) on their way back from a day at the Chipping Norton steeplechase.